Wow, what an awesome week! On Monday I got the chance to go to downtown Cleveland and professionally record my song at the Tri-C. I had so much fun and enjoyed the time I had. Yet, with all fun, time flies by quickly. I am so thankful for the people who gave me the opportunity to record in the studio, not to mention the people who also gave up their time to help with recording. A big thanks for everyone involved! I also am excited about the upcoming Family Advocacy Day! The days are starting to blur together. Can’t wait! 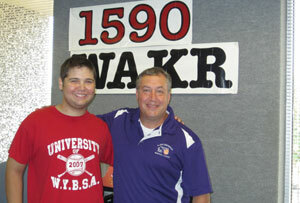 Last Thursday, I was interviewed by Ray Horner of WAKR AM about the trip. Sunday we leave for Washington, DC, and it’s coming up fast. I really hope that we can make a difference while there. I hope to be the voice for all the others who are struggling and those whose life-changing stories are not being heard. I want to give my best and be my best in representing the patients and families of Akron Children’s Hospital. This experience is not just about me and my life story. It’s also being the voice for others and about supporting a great hospital and making sure that others can have that second chance at life, just as I did. To learn more about my story and Family Advocacy Day, listen to the Ray Horner Show interview below.